Are you wondering how to rank your images in Google image search engine, but like every other blogger, you are not conscious of the fact that how Google rank them? Being a Blogger user, a lot of people stay away from optimizing their post images that not only help you get more visitors, but also gives a comprehensive rise to your SEO. 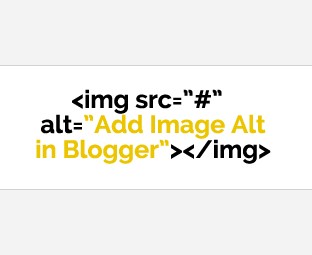 Therefore, today in this post we will be discussing how to add ALT tag to images in blogger and some common image optimization techniques for Blogger. One of the most modest ways of making your image stand out from other websites is to give it an ALT Attribute in your image tags. It is extremely hard to believe that most of the people forget to use this in their images. In fact that now Search engines give it a significant amount of priority while ranking them in search results. ALT attributes for images is a tool that defines an image. Since, web browsers, search engines and others bots cannot read an image by themselves. Therefore, by adding an image ALT we provide them an ability to understand it in a better way. The very first thing you need to do is to go to Blogger >> Add a new post. Now it is up to you to upload an image or add it from an external source, we have already covered how you can upload images in blogger so check that tutorial before proceeding to the next step. Once the image is uploaded successfully, click on the image and you will be able to see a blue tool bar that has quite a few options for image optimization. 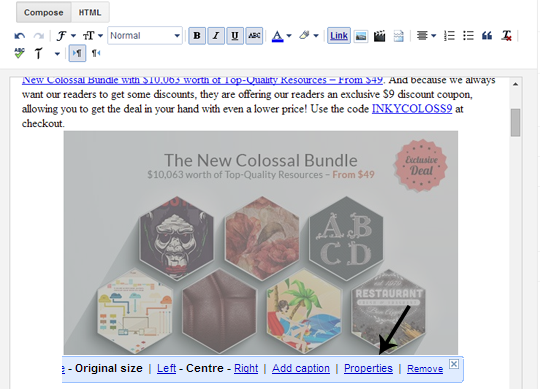 Select Properties and enter the ALT and Title in the text box. Tip: The ALT should be of a four to five words defining the image. Once done, press OK.
Congratulations: You have successfully learned how to add ALT tag to images in blogger, you can also use the following alternative code to add ALT tag to images in any platform like HTML, WordPress and even Blogger. Be brief: Do not play around the bushes and keep it concise as possible because some browsers will not read it properly if the ALT is way too long. Keep your point Clear: Make sure your context is well defined, not confusing. Some people with low internet connection will only see the text so make it clear. Do not make it only for Search Engine: Many people stuff too much keywords just for getting a better rank in search and later the regret when they get penalized, so keep it simple. We hope this tutorial may have helped you in optimizing your images and giving them a better rank in Search engines like Google, Bing, Yahoo and etc. Do share your thoughts about the tutorial in the comments below and let us have a quality conversation below that could benifit everyone. This is great information for image seo +Syed thanks for this awesome information.. i am looking forward for your upcoming posts- i am crazy of your articles..
Is in Images ALT tags both Title tag and ALT should be same. please tell me i am confused. If it is same, it is a good practice.